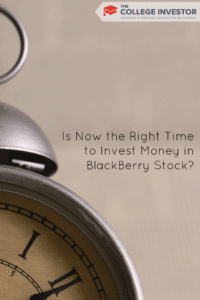 Home » Is Now the Right Time to Invest Money in BlackBerry Stock? Nokia’s (NYSE: NOK) stock price shot up more than 30 percent from the recent announcement of the Microsoft (NASDAQ: MSFT) acquisition. Seeing this “old” player in the cell phone market get acquired made me think about another stock that we’ve looked at here at The College Investor: BlackBerry. While Research in Motion (NASDAQ: BBRY) was trading higher the same day, it did not rise nearly as much. Many times in sectors, when consolidation takes place, it will happen with all of the candidates for acquisitions eventually becoming takeover targets, and rewarding shareholders with higher stock prices. There have been many rumors of companies such as Samsung (PINK: SSNLF) being interested in buying Research in Motion for its BlackBerry franchise. Plus, we’ve speculated that Samsung and Google could part ways. Either way, there is a big shake-up happening in the handset market right now. The bottom line is that BlackBerry has certainly not rewarded the shareholders. Now trading around $10 per share, Research in Motion is down from well over $100 in the late 2000s. For 2013, Research in Motion is down almost 14 percent in a year that has witnessed by the Dow Jones Industrial Average (NYSE: DIA) and Standard & Poor’s 500 Index (NYSE: SPY) rising in double digits. A case can be made for BlackBerry, especially after the Microsoft deal for Nokia, however. BlackBerry is very undervalued. The price-to-sales ratio is just 0.43. That means that each dollar of sales is going at more than a 50 percent discount in the stock price. The price-to-book value is 0.56. That means that the assets of BlackBerry are at more than a 40 percent discount in the stock price. However, it’s important to remember how misleading book value can be. For example, BlackBerry reports having about $3.5 billion in intangible assets — patents and trademarks, logos and branding, and goodwill. If there was a liquidation event, chances are many of these things would be worthless. However, that still leaves them with about $7 billion in current assets, which could be liquidated if needed. The analyst community expects earnings-per-share for BlackBerry to soar more than 60 percent over the next year. Over the past five years, sales growth has been strong. Unlike Nokia, BlackBerry does not have any debt (and total liabilities of around $3 billion): a clean balance sheet like that is always very appealing to companies on the prowl for takeovers! In addition, if just one BlackBerry smartphone becomes a hit in the future, it would do much to restore the brand of the company and raise the price of the stock. While Apple (NASDAQ: AAPL) has the most appealing smartphone, at present, the iPhone 5 did not devour the market. That is why Apple stock has performed so poorly. The trouble is that innovation is tough to predict. The Microsoft buy of Nokia could motivate Samsung or some other company into action. BlackBerry is certainly cheap with a market capitalization of just $5.35 billion. Samsung had $8.33 billion in operating profit last quarter. BlackBerry could be a classic “value trap,” however, priced low due to inefficiency in valuing its sales and assets. Remember, to avoid value traps, you should look for three criteria: share repurchases, dividend relative to its peers, and debt reduction. BlackBerry has announced share repurchases in the past (and totally failed at timing), but there are none on the horizon. It currently does not pay a dividend and probably doesn’t plan to. But it does have low debt. With only meeting one of three criteria, I would still be leery about BlackBerry’s value. A final thought: it was trading over $18 per share as its 52-week high over the past year. With Nokia now part of Microsoft, others might take action in response. If so, that will reverse the downward trajectory of the stock price for BlackBerry. What are your thoughts on BlackBerry? The book value is certainly low, but Wall Street sets the market price based on what they expect to happen in the future, not what is happening today. So, that tells you that the market is skeptical. I look at it pretty simply, and that’s looking at people’s hands. Is anybody holding a Blackberry these days? I’ve seen one. In our extended family alone, we went from having four to having zero in the period of less than a year. Nokia turned the tables a while back and was slowly building a lot of buzz. I never saw the same out of Blackberry. I think it has the potential to be a good short term trade given all that seems to be going on. I would not really look at it for any type of long term holding as it very well could be a value trap. Unless Blackberry announces something revolutionary, it seems as though they are on their way out. I won’t be buying any Blackberry stock. It probably is a value trap and has a good chance of going even lower. Based on the current situation of Blackberry the future seems bleak. 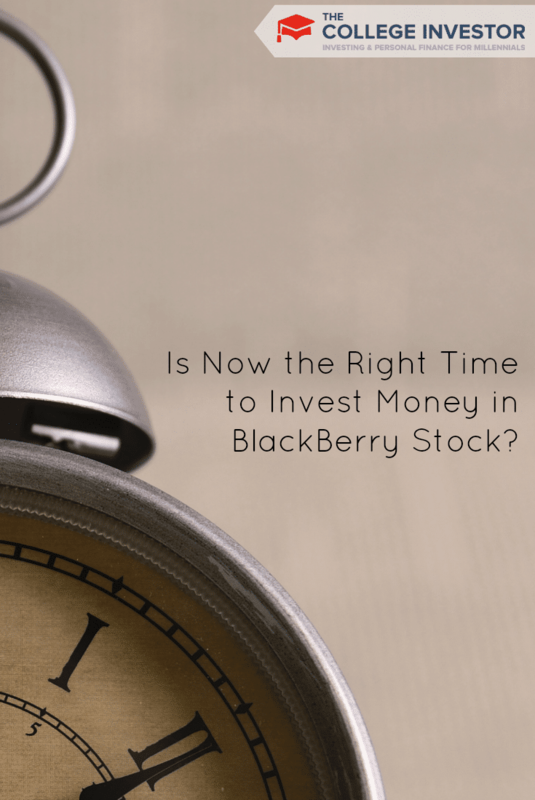 And the potential value of investing in Blackberry stocks is not good at all. If something great happens then I might consider it, otherwise nay. I think we are seeing group think on Wall Street. The Z10 is outstanding . I have one. I own bbry shares and I am confident that the share price could go way higher than what we see these days. While Wall Street is being silly, I am accumulating. I will gladly sell you these shares when I am tired of making money.